Several contributions on Horneophyton in the scientific literature concern sporangia [1,2,3], epidermis , and the tubers in the ground . Additional evidence concerning the often odd-shaped sporangia, the peculiar preference of the tubers to form level bands inside, and the arrangement of the tubers in strings has been presented on this website. Apparently not much attention has been paid to the tuber tissue because most often there are no distinctly seen details except for the rugged dark base of the central strand (Fig.1). 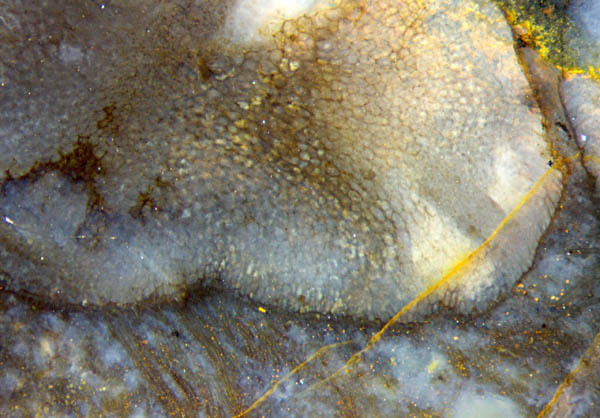 The present specimen is uncommon with an unexpected boundary inside the tuber, marked by more clearly seen cells with whitish lumina and dark stains near the walls. As seen in Fig.2, this coarse boundary separates tissues of different structure. 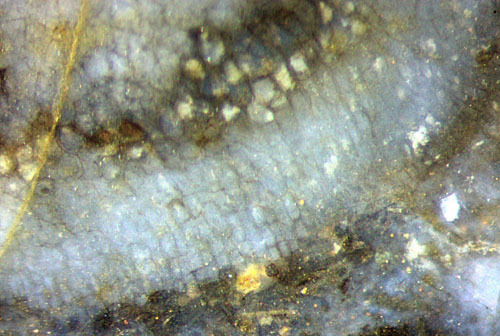 Fig.1: Horneophyton tuber, 5mm wide, on the raw surface of a Rhynie chert sample. Note the uncommon boundary above the bottom. Rhizoids and part of the central strand are missing here. Fig.2: Horneophyton tuber, detail from Fig.1 below right. Note the texture of the tissue between the dark boundary and the bottom. Width 1.7mm. Above the boundary the cells are polyhedral without an apparent order. Below the boundary the cells are smaller and tend to be rectangular and arranged in files directed towards the bottom. The question arises whether or not this particular structure formed by the exceptional tuber in Fig.1 is also found, possibly less conspicuous, in other specimens. 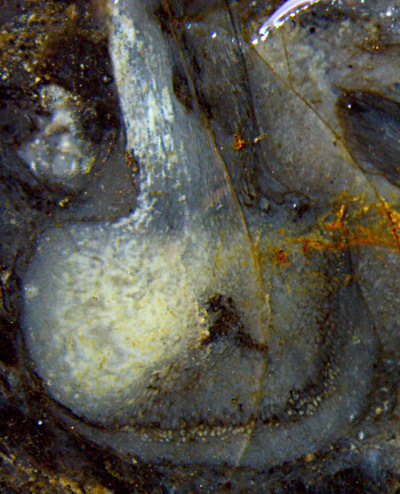 In Fig.3, taken from the same chert sample only about 1cm away from the big tuber in Fig.1, some of the lowermost cells are nearly rectangular and elongated, oriented towards the bottom, perhaps in connection with the rhizoids grown from there. A similar texture of part of the tissue is more distinctly seen in rhizomes of other plants in the Rhynie chert. In the case of Horneophyton, this easily escapes notice because the tissue of the tubers is most often degraded and not seen as clearly as in these images. Also there are tubers whose lowermost cells do not seem to differ from the others. The question whether textured tissue had always been present at the bottom of the tubers, even if not well seen after degradation and silicification, may be answered by means of additional fossil evidence.